The softTP teach pendant is designed for use with softMC 3 and softMC 7 motion controllers and robotic configurations of up to six axes. It features a color touch screen and a streamlined visual interface that simplify operation and programming tasks. 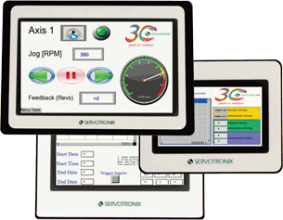 The softMI is a touch screen graphic terminal that allows machine operators to control, monitor, and collect data from automated industrial machines and servo motion systems controlled by softMC motion controllers.